Ralph of Diceto (d. 1202) gained an education in Paris, and became a dean of St. Paul's Cathedral in 1180. He wrote a variety of historical works. At the top edge of this page the title 'Cronica Rad. 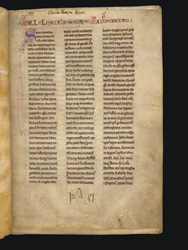 De Diceto' has been added, and in the lower margin the pressmark of St. Mary's abbey, York ('In A. xi'). The main text is a letter from Ralph to William de Longchamp, Chancellor of England, and bishop of Ely. William's brother Robert was abbot of St. Mary's, York, which may explain how it found its way there. The three-column layout is unusual.